The Archives page is used to create and restore archives of system settings. 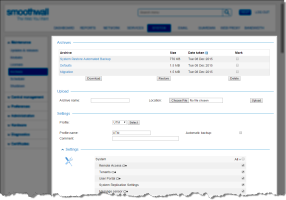 Archives can be saved on removable media and used when restoring a Smoothwall. They can also be used to create clones of existing systems. You assign a profile to an archive enabling you to specify which components you want backed up in a particular archive. You can create and assign up to 20 profiles and generate their archives automatically. Archive profiles are also used to share settings in centrally managed Smoothwalls, referred to in this case as replication profiles. For more information about centrally managed Smoothwalls, see Setting up a Centrally Managed System. 1. Go to System > Maintenance > Archives. • Profile — To create a new profile, from the drop-down list, select Empty and click Select. To reuse or modify an existing profile, from the drop-down list select the profile and click Select. • Profile name — Configure a meaningful name for the profile. Note that this isn't the name of the archive; archives are named <hostname>.<release_level>.<datestamp>. • Comment — Optionally, enter a description for the archive. • Automatic backup — Select this if you intend to use this archive profile in a scheduled backup. For more information about using scheduled backups, see Scheduling Backups. 3. 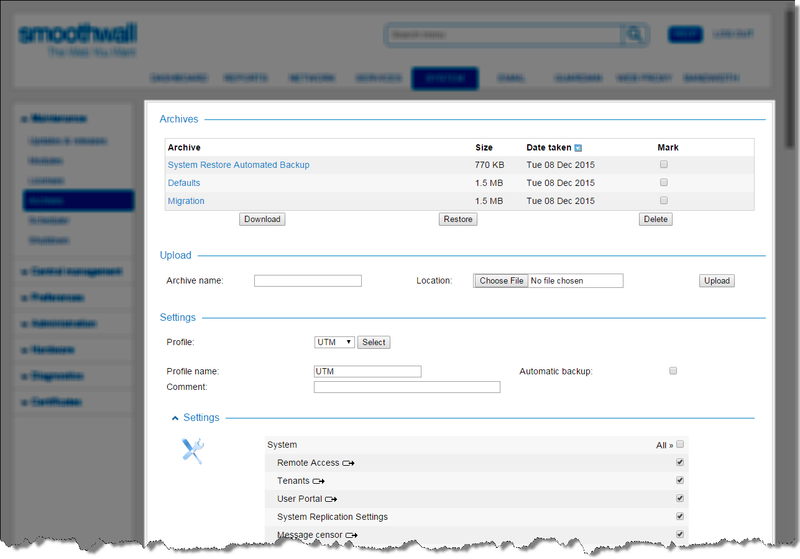 From the Settings > Settings section, select the components you want to archive or select All to select and archive all settings.Available settings include general settings for the Smoothwall, and replicable settings ( )which can be used in a centrally managed Smoothwall.  Automatic updates schedule — All configuration from the System > Maintenance > Updates & releases page, including the release or update level.  Certificates — All configuration from the System > Certificates pages. This setting is replicable.  Message censor — All configuration from the Services > Message censor pages. This setting is replicable. Note: All configuration from the Network > Settings > Address object manager and Network > Settings > Service object manager pages are automatically backed up as the objects are used across multiple pages. Any service objects or service object groups you create on the parent node of a centrally management system are replicated to the child nodes in addition to their own service object configuration. These are prefixed with Replicated: in the relevant user interface pages.  Remote Access — All configuration from the System > Administration > Admin options and System > Administration > Administrative users pages. This setting is replicable.  Report templates — All report templates, including any custom report templates from the Reports > Reports > Reports page. This setting is replicable.  Reporting Database Settings — All configuration from the Reports > Settings > Datastore settings page.  Safeguarding — All configuration from the Reports > Safeguarding > Notifications page, and Reports > Safeguarding > Exclusions page.  System Replication Settings — All configuration from the System > Central management pages, and the System > Hardware > Failover page.  System Services — All configuration from the Network > Configuration > DNS page. This setting is replicable.  Tenants — All configuration from the System > Administration > Tenants page, if licensed. This setting is replicable.  Uninteruptable [SIC] Power Supply (UPS) — All configuration from the System > Hardware > UPS page. This setting is replicable.  User Portal — All configuration from the Services > User portal pages. This setting is replicable. All configuration for the Anti-Spam module from the Email menu. This also includes the settings for the email log viewer (Reports > Realtime > Email and Reports > Logs > Email).  Auth settings — All authentication configuration from the Services > Authentication pages with the exception of the BYOD and Chromebook pages; these have separate options. This setting is replicable.  BYOD settings — All BYOD configuration from the Services > Authentication > BYOD page. This setting is replicable.  Google authentication / Chromebook settings — All configuration from the Services > Authentication > Chromebook page. Note: This component block does not cover Guardian authentication settings. This is covered by the Guardian3 component block below.  Bandwidth Management management settings — All configuration from Bandwidth Management > Control pages. This setting is replicable. All configuration from the Services > DHCP pages. All configuration from the Services > Proxies > FTP page.  Alert settings — The configuration from the Web filter violations, and Web filter URL violations alerts (Reports > Alerts > Alert settings).  All customized categories and content modifications — All customized content, including content from the blocklist, Guardian > Policy objects > Categories, and Guardian > Content modification > Content modifications pages. This setting is replicable.  Authentication Exceptions — All configuration from the Web proxy > Authentication > Exceptions page. This setting is replicable.  Authentication policy — All authentication policies configured in the Web proxy > Authentication pages. Also the configuration from the Web proxy > Web proxy > Automatic configuration page. This settings is replicable.  Global Proxy settings and certificates — All configuration from the Web proxy > Global proxy pages. This setting is replicable.  Log retention — The configuration for the web filter and search terms logs.  MITM certificates — The HTTPS inspection certificates (Guardian > HTTPS inspection > Settings). This setting is replicable. Note: If you make use of a centrally managed Smoothwall configuration (see Setting up a Centrally Managed System), and have enabled MITM certificate replication, you must ensure the parent node's HTTPS interception certificate is installed and set on all child nodes. For a detailed description of how to do this, see Managing HTTPS Interception Certificates.  Machine-specific proxy settings — All Web proxy configuration that are for the hardware running this instance of Smoothwall, such as, the interface address for the automatic configuration script address, and the interface address for the manual web browser proxy settings.  MobileProxy server — All MobileProxy configuration from the Web proxy > MobileProxy pages.  Proxy — All generic web proxy configuration from the Web proxy pages that are not backed up by Machine-specific proxy settings. This setting is replicable.  Smoothwall Connect v3 Proxy settings — All configuration from the Web proxy > Global Proxy > Settings.  Swurl credentials — All configuration from the Guardian > Swurl > Settings page.  Upstream proxies — All upstream proxy configuration from the Web proxy > Upstream proxy pages. This setting is replicable.  Web Cache Communication Protocol (WCCP) — All configuration from the Web proxy > Web proxy > WCCP page. This setting is replicable. All configuration from the System > Hardware > Failover page, plus the configuration for the heartbeat interface in Network > Configuration > Interfaces.  Intrusion Detection settings — All configuration from the Services > Intrusion system > IDS page. This setting is replicable.  Intrusion Prevention settings — All configuration from the Services > Intrusion system > IPS page. This setting is replicable.  Intrusion System Policies and Signatures — All configuration from the Services > Intrusion system > Policies and Services > Intrusion system > Signatures pages. This setting is replicable. All configuration from the Services > Proxies > Instant Messenger page. The output configuration for all alerts from the Reports > Alerts > Alerts page is also included. This setting is replicable.  Output Settings — All email and SMS configuration for the alerting and reporting module, from the Reports > Settings > Output settings page. This setting is replicable.  User and Group Settings — All reporting group configuration from the Reports > Settings > Groups page, including user-to-alert and user-to-report allocation. This setting is replicable.  Reverse Proxy settings — All configuration from the Services > Proxies > Reverse proxy page. This setting is replicable.  Routing settings — All configuration from the Network > Routing > RIP page. This setting is replicable.  Group — All configuration from the Network > Settings > Port groups page. This setting is replicable.  Port lists — All configuration from the Network > Outgoing > Ports page. This setting is replicable.  Service lists — All configuration from the Network > Outgoing > External services page.  Sources and Destinations — All configuration from the Network > Outgoing >Policies page. This setting is replicable.  SIP proxy settings — All configuration from the Services > Proxies > SIP page. This setting is replicable.  SNMP settings — All configuration from the Services > SNMP > SNMP page. This setting is replicable. All configuration from the Network > VPN pages. All configuration from the Network > Filtering > Zone bridging, Group bridging, and Ethernet bridging pages. 4. Click Save and backup to create the archive. 1. In the Archives area, select the archive. 2. Click Download and save the archive to disk using the browser's Save as dialog box. 2. Click Restore. The archive contents are displayed. 3. Select the components in the archive that you want to restore and click Restore. You upload archived settings from previous versions of the Smoothwall and Smoothwall modules so that they can be re-used in the current version(s). 1. In the Upload area, enter the name of the archive and click Browse. 2. Go to and select the archive. 3. Click Upload to upload the archive.